Schmartboard|ez 0.5mm Pitch SOIC to DIP adapter (204-0007-01) - Schmartboard, Inc. This product is an SOIC to DIP adapter with a twist. These have our patented "ez" technology which means that soldering the surface mount component is simple, and as with all of our "ez" boards, we are the only company with a patented solution for easily soldering surface mount parts. Included in the package are .5mm pitch adapter boards for 10 leads and 28 leads. The 10 and 28 pin boards also include room for 0805 SMT components such as a bypass capacitor and pads for easy access to a ground. A standard row of 40 headers has been included as a bonus for your convenience. 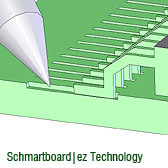 It uses Schmartboards patented "EZ" technology which makes hand soldering surface mount fast, easy and flawless. It has pre routed traces to minimize the use of wire jumpers. It has easy access to copper ground. It makes it possible to breadboard surface mount components. Click the button below to add the Schmartboard|ez 0.5mm Pitch SOIC to DIP adapter (204-0007-01) to your wish list.